I was seated on a comfortable bar stool set up against a large granite island countertop in the most bright and beautiful kitchen. I was eating a mouthwatering salad of mixed greens, lobster, and avocado, dressed in a fresh vinaigrette. It was course two of a nine course tasting menu. On the other side of the island countertop, dressed in a dalmation print apron, was Chef Patrick O’Connell, busy at the stove, artfully crafting the most perfect dishes. Then it occurred to me. I’m sitting in the kitchen at The Inn at Little Washington and Patrick O’Connell is personally preparing me a nine-course tasting menu. That’s when I realized that I was probably dreaming. But I took another bite of lobster and then proceeded to share a story with my new pal, Patrick, about how the cast of The Hills randomly stopped by my beach house one afternoon to use the bathroom. He laughed and then told me of his encounter with the cast of Jersey Shore. Mind you, I neither have a beach house, nor have I ever even watched The Hills, let alone met the cast. I took another bite of my salad. Patrick took a piece of foie gras out of the fridge and raised the heat on the skillet. Course three would be foie gras. Fantastic. In the background, I heard an unusual roar and a thump. I turned my attention to a woman who’d entered the kitchen and was standing on the opposite side of the island countertop. Clearly she was an acquaintance of Patrick. She was flipping through the pages of a scrapbook. 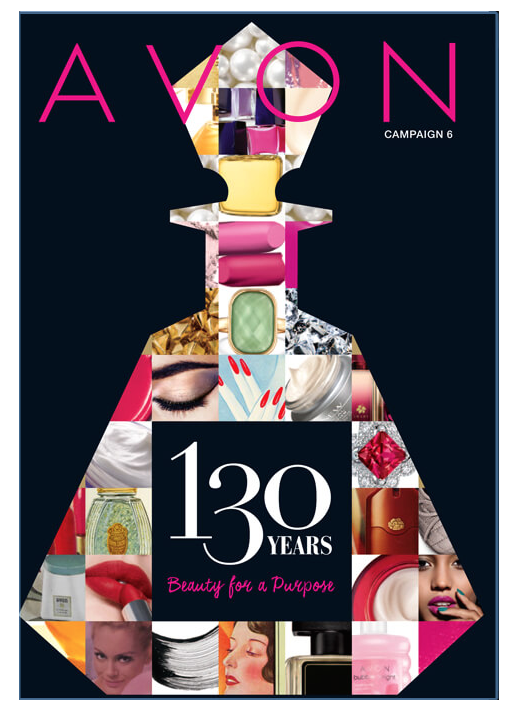 Feeling right at home, I began flipping through the pages with her; pictures of a grandson. I heard the pop and sizzle of the foie gras hitting the hot pan. And then that strange roar and thump again. Patrick began preparing my plate, with a perfectly petite mound of baby watercress and a drizzle of a thick, dark sauce. Is that a cherry-balsamic reduction? My mouth was watering. Roar and thump. I opened my eyes. Roar and thump; the sound of the garbage truck passing down my road. I quickly closed my eyes, pressed them tightly together, desperate to return to The Inn at Little Washington. Come on! The foie gras was almost ready! I tried to will myself back into that dream. No such luck. Moments later, a small voice, magnified by the effects of the baby monitor, called to me, Mommy, I’m done with my nap, followed by the sound of small footsteps as he ran to exit his room. You owe me seven more courses, Patrick O’Connell, starting with that foie gras! Back to reality… Today’s recipe is the brainchild of three hungry minds. It began with a discussion of an apple cinnamon cream cheese, which my sister enjoys at the bagel shop near her office. 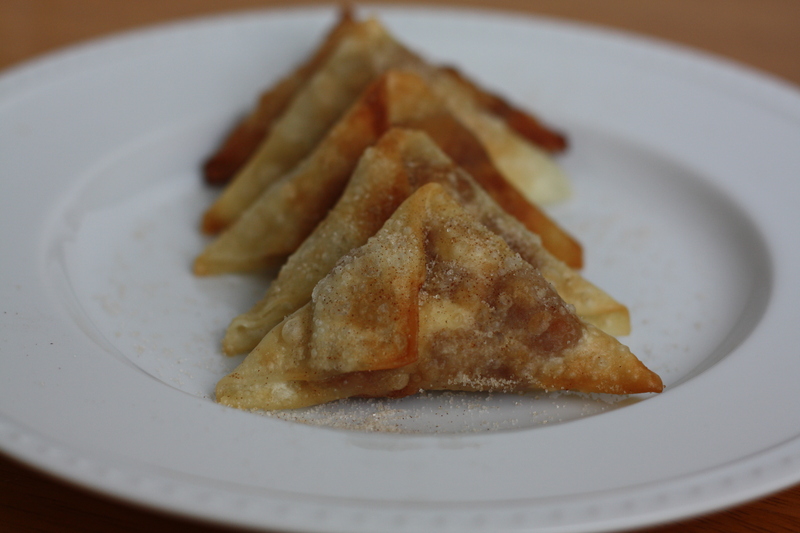 Within moments, we’d developed a fully formed idea for a decadent treat, which we named Apple-Cinnamon Rangoons. 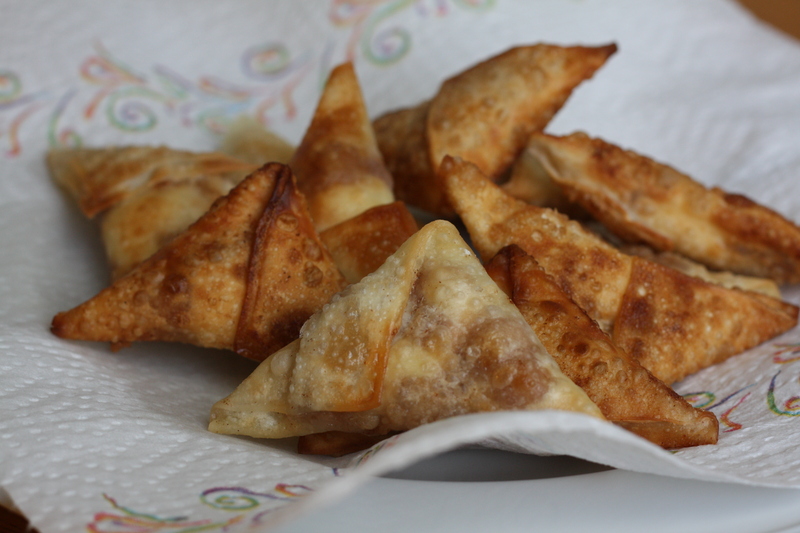 Think crab rangoons, but take away the crab and throw in some cinnamon apples instead. Pure genius. I’d have made them that very moment if I wasn’t missing the essential cream cheese and too lazy to run down to the grocery store. But I made these little babies yesterday and boy are they spectacular! They’re a tad tedious to assemble, but the result is well-worth the small labor. Make sure you make these when you have a crowd of people around to help you eat them. Or trust me, you will eat them all yourself. *My grocery store carries Wonton Wrappers in the frozen foods section. Some grocery stores carry them near the refrigerated produce. Defrost before using. In a skillet, melt the butter over medium heat. Add the diced apples. Stir and cook for a minute or two. Add the brown sugar, cinnamon, and water. Stir until the brown sugar begins to melt and coat the apples. Cook for a few minutes until the apples are tender, but not mushy. Cool before using. Set up a work station with the cinnamon apples, cream cheese cubes, defrosted wonton wrappers, a small bowl of water, and a large piece of wax paper. Place a cube of cream cheese in the center of a wonton wrapper. Place a small spoonful of the cinnamon apples around the cream cheese. 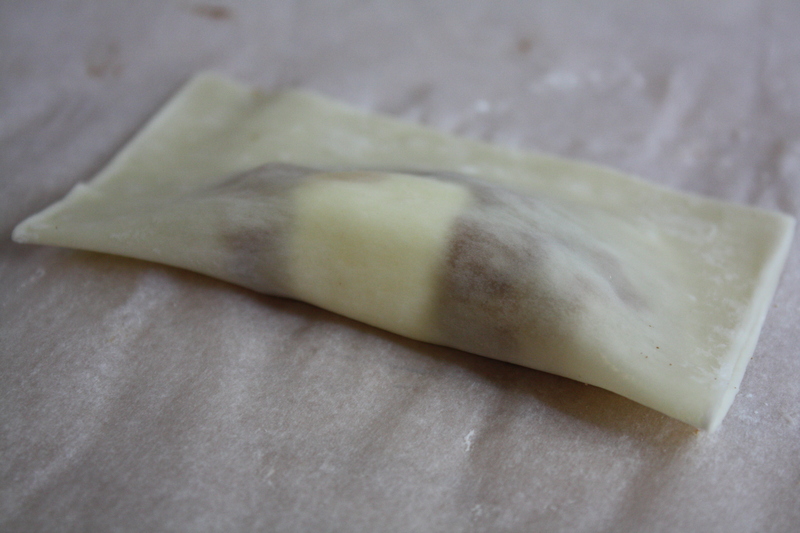 Use your finger or a pastry brush to wet the edges of the wonton wrapper with water. 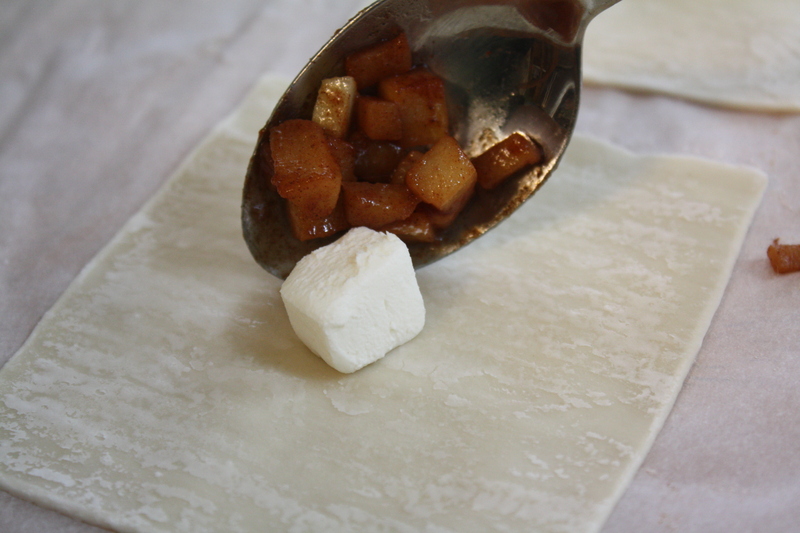 Fold the wrapper in half, over the filling, to create a rectangle. Use your finger or a pastry brush to wet one corner of the rectangle. Fold the corner down to form a diagonal edge. 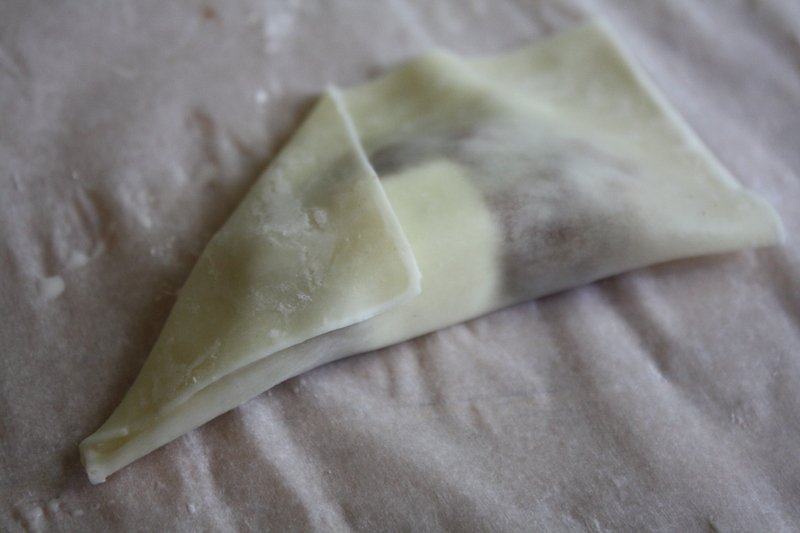 Turn the wonton wrapper over and fold down the opposite corner, to form a triangle packet. 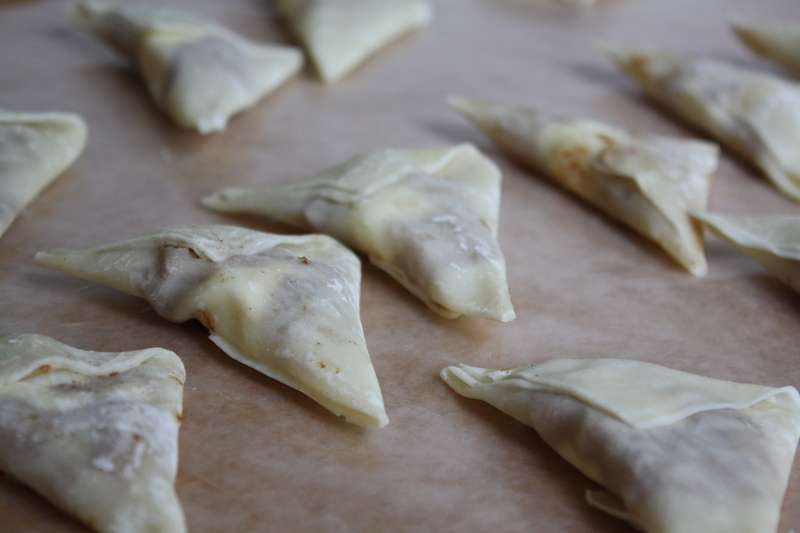 Place the prepared rangoons onto the wax paper. **It’s not absolutely necessary to fold the wonton in this manner. You can create any type of packet, even as simple as folding the wonton wrapper in half diagonally. Repeat until you’ve used all of the filling. To cook, heat about 1/2″ of vegetable oil in a skillet. Get it good and hot. Add a few of the rangoons and cook for a minute or two on each side, until golden brown and crispy. If they seem to be cooking too quickly, turn down the heat. Remove the rangoons from the oil with a slotted spoon and place on a paper towel to remove excess oil. Sprinkle the hot rangoons with a mixture of the cinnamon and sugar. Serve hot. Posted in Desserts, Food, Fruit, General Rambling and Such, Recipes and tagged apples, autumn, Cooking, Eating, fall, Food, fruit, life, Patrick O'Connell, Rangoons, Recipes, The Inn at Little Washington. Bookmark the permalink. Those sound wonderful. I think it’s the perfect way to use up the wrappers I have in my fridge. Seriously delicious treat – YUM. The brilliant part of this recipe is that it’s a base for putting deserts into a fried packet. I wonder how a pumpkin pie flavor profile would work. I’m not a fan of pumpkin pie though, so I’ll leave that to someone else. Or doing a fried cheesecake en croute type deal….mmmmmmm. The brilliance just doesn’t stop. I think I’ve found my Christmas gathering goodie for the year! … Maybe Thanksgiving – I’m not sure I can wait until Christmas. these are the absolute perfect dessert! i love apple and cinnamon. look sooo good! Reblogged this on Bluetieoptional's Blog.